The other day, I revived one of lost blog posts written in 2005. It was entitled "New books on atomic bombs." An overseas friend of mine wrote a comment on it and asked me if I knew a similar list of movies or documentaries. I did not know such a list. So, I made a search on the Internet, and results gotten are summarized here. The third list above is difficult for the overseas friend to understand. Thus, I made a modified list as given below by including a few entries from the first two lists, adding English titles and providing links to English Wikipedia pages when available. I wish that these films that convey the colossal tragedy the atomic bombs brought are appreciated by a lot more of people world over and that total elimination of nuclear weapons is realized as soon as possible. Note: English titles are official ones except for those given in parentheses, which are used to indicate to be the literal translation by T.T. Some of Wikipedia pages explain not only about the film but also dramas, books, etc. 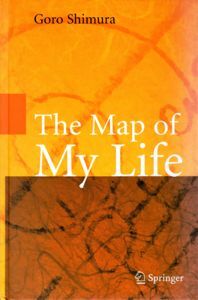 of the same title; and some others contain an extremely brief description only. 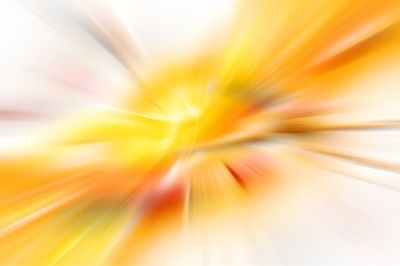 Abstract image reminiscent of light rays flying past. Aaron: The object's mass is zero when it is traveling at the speed of light, right? Where does its mass go? Does it turn into energy? Particles with masses different from zero, when they are at rest (rest masses), can be accelerated to speeds fairly close to the speed of light by the use of large accelerators such as the Large Hadron Collider in CERN. When the particle get higher speeds, the mass of the particle does not approach zero, contrary to your supposition, but becomes larger to make the total energy higher. 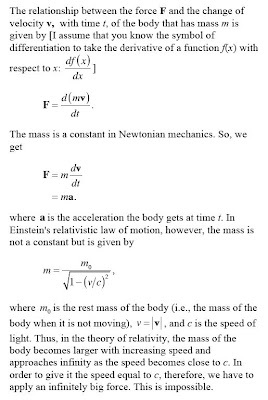 As a result, no body with a nonzero rest mass can be accelerated to reach just the speed of light. This is explained below by the use of a few equations (clicking on the image, you can see a larger one). Thus, the situation in your question that an object with a finite rest mass would reach the speed of light does not happen. * Neutrinos were once thought to have zero mass, but the experimentally established phenomenon of neutrino oscillation requires neutrinos to have nonzero masses. As for the experiment that suggested the possibility of neutrinos traveling faster than light, mention will be made in a later story of this series. Aaron: It seems that Newton did not know exactly how gravity worked. Then, there came Einstein to find the answer. 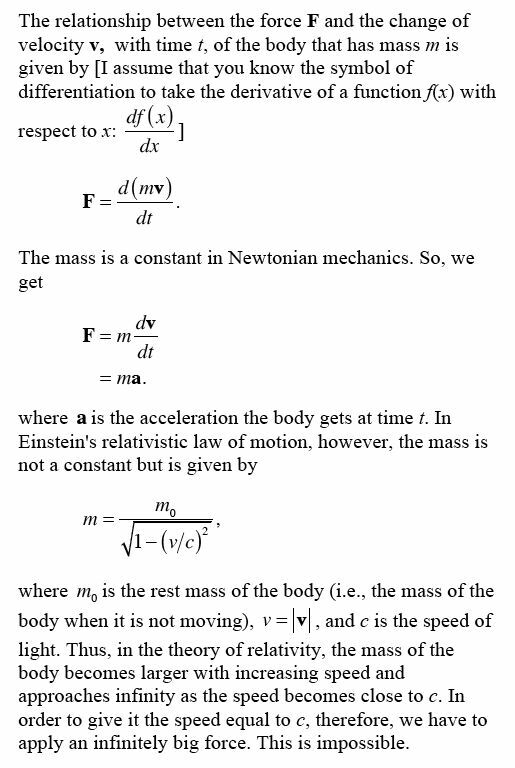 Why do they still write about Newton's law of gravity in textbooks? 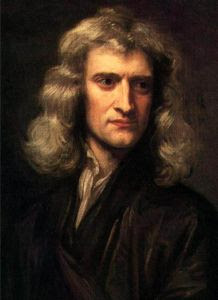 Ted: Newton's law of gravity and equation of motion are highly accurate approximations to Einstein's general and special theories of relativity. Einsteinian mechanics did not make Newtonian mechanics useless but expanded the scope of the latter. The latter is quite simple and yet is useful for doing calculations of the motion of materials being situated in a weak gravitational field and having a speed much smaller than the speed of light. Therefore, we first study Newtonian mechanics at high schools. 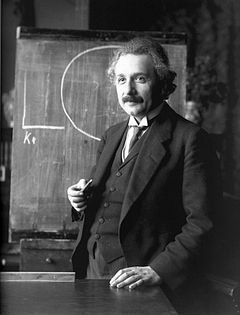 Note Added later: An educational blog post on the relation between Einstein's relativity and Newton's mechanics has appeared: Matt Strassler, "How did Einstein do it?" Blog site Of Particular Significance (2012). 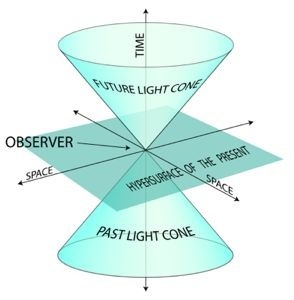 Diagram showing space and time in space-time. Here space is depicted as a two-dimensional entity in three-dimensional spacetime. Time from the observer's viewpoint is represented as a vertical line. Image by K. Aainsqatsi (Own work) [Public domain], via Wikimedia Commons. Aaron: Will there be time, if there is no space? Ted: Your question does not seem to be a valid one in physics. Physics is the branch of natural science to study matter and its motion through spacetime; and these, i.e., matter, motion and spacetime, are inseparable from space. * From this viewpoint, physicists are not expected to think about the circumstance in which there is no space. In treating a complex problem, physicists often assume a simplified model of the situation, but elimination of space would make the problem non-physical. However, the following should be noted in relation to your question: Approaches to quantum gravity, being studied for uniting quantum mechanics with general relativity, suggest the possibility that space and time are not fundamental entities but emergent phenomena (see, for example, Ref. 1). If such is the case, the phrase in your question, "there is no space," would have physical meaning in the sense that equations of quantum gravity would dispense with space and time variables. * Especially in the theory of relativity, space and time (to say precisely, imaginary time) are treated symmetrically, and it can happen that part of time duration of one observer is part of spatial length of the other observer. Luboš Motl, Emergent space and emergent time, The Reference Frame (2004). Aaron: I read in some books that Einstein did not believe in black holes. Then, why did he publish the work of general relativity that predicted black holes? It seems that Einstein always was of the opinion that singularities in classical field theory are intolerable. 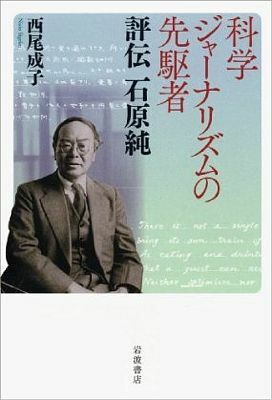 They are intolerable from the point of view of classical field theory because a singular region represents a breakdown of the postulated laws of nature. I think one can turn this argument around and say that a theory that involves singularities and involves them unavoidably, moreover, carries within itself the seeds of its own destruction. In other words, Einstein's belief in his own theory combined with his opinion about physical theories in general did not allow the existence of the black hole. However, his theory was cleverer than his opinion and predicted what was confirmed by (indirect) observations. A physical theory or an equation can sometimes be more reliable than the philosophical opinion even of the greatest man. "Section 1. 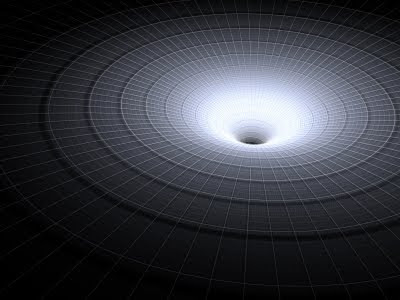 History" in "Black hole", Wikipedia, The Free Encyclopedia (19 December 2011 at 11:28). Quoted in Philosophical Problems of the Internal and External Worlds: Essays on the Phylosophy of Adolf Grünbaum edited by John Earman (University of Pittsburgh Press, 1993), as written by Peter Bergmann (1980, 156).